Baker's yeast growing on an agar plate. Credit: Rainis Venta. Image rights: Creative Commons Attribution-Share Alike 3.0. Despite a billion years of evolution separating humans from the baker's yeast in their refrigerators, hundreds of genes from an ancestor that the two species have in common live on nearly unchanged in them both, say biologists at The University of Texas at Austin. 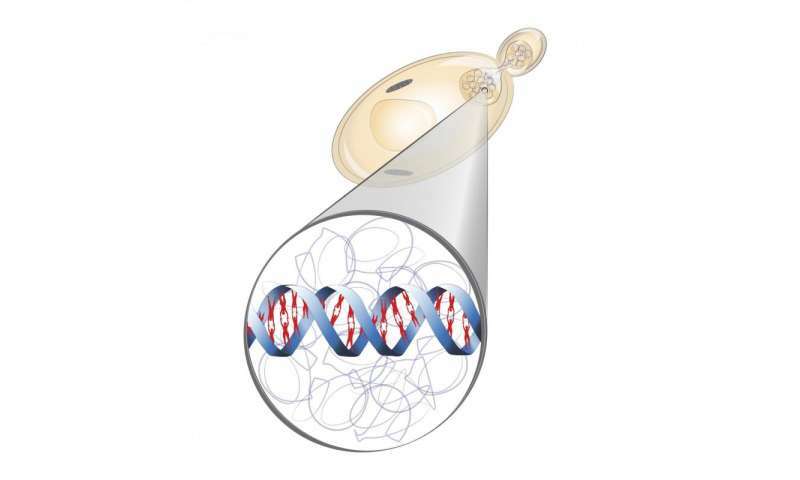 The team created thriving strains of genetically engineered yeast using human genes and found that certain groups of genes are surprisingly stable over evolutionary time. Although yeast consist of a single cell and humans have trillions of cells organized into complex systems, we share thousands of similar genes. 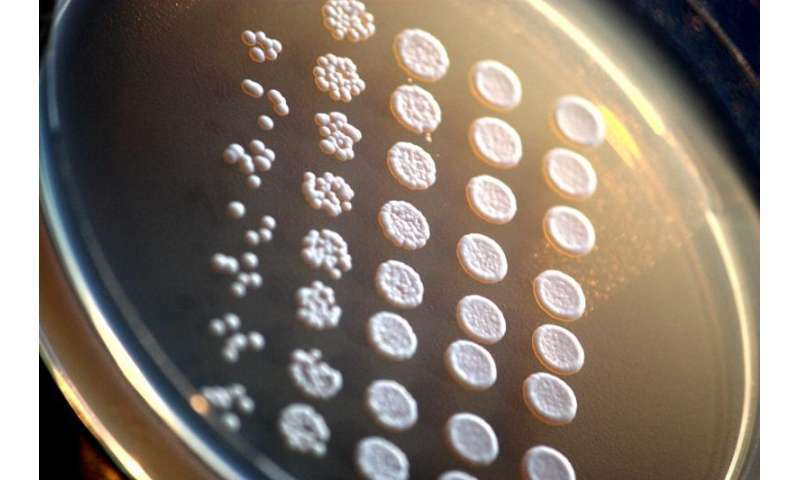 Of those, about 450 are critical for yeast's survival, so researchers removed the yeast version of each one and replaced it with the human version and waited to see whether the yeast would die. Creating hundreds of new strains of yeast, each with a single human gene, resulted in many newly engineered strains—nearly half, in fact—that could survive and reproduce after having human genes swapped in for their ordinary ones. "Cells use a common set of parts and those parts, even after a billion years of independent evolution, are swappable," said Edward Marcotte, professor in the university's Department of Molecular Biosciences and co-director of the Center for Systems and Synthetic Biology (CSSB). "It's a beautiful demonstration of the common heritage of all living things—to be able to take DNA from a human and replace the matching DNA in a yeast cell and have it successfully support the life of the cell." Excerpt: "Despite a billion years of evolution separating humans from the baker's yeast..."
If you think the credibility of claims about billions of years of evolution and no evolution in 2 billion years and re-evolution of a complex functional structure in 4 days should be questioned, you are probably a serious scientist, not an evolutionary theorist. "We have little empirical evidence about how evolution occurs at the gene network level..." author of the study. "Elucidating the role played by negative-feedback regulation on cross-species network activity differences adds to our understanding." Empirical evidence that links the biophysically constrained chemistry of nutrient-dependent RNA-mediated protein folding to cell type differentiation in all cells of all individuals of all genera suggest that claims about billions of years of evolution are absurd. Metabolic networks and genetic networks are epigenetically linked from viruses and viral microRNAs to entropic elasticity. Without the anti-entropic epigenetic effect of nutrient-dependent microRNAs, metabolic networks could not be linked to biodiversity via genetic networks. https://answersin...esources Excerpt: "An estimated 1031 bacteriophages (ten thousand billion billion billion) fill the earth, and bacteriophages infect 1024 bacteria per second.1 There is a tremendous amount of genetic material flowing in and out of bacteria at any given time!" This genetic material is placed into the context of information about the source of nutrients that link metabolic networks to genetic networks. Mathematical models link the biophysically constrained nutrient-dependent chemistry of protein folding from ecological variation to ecological adaptations via the physiology of reproduction. Excerpt: Mathematical models of ocean ecosystems suggest that by killing so many microbes, viruses could release carbon and other organic nutrients back into the environment, providing an easy source of nutrients for other organisms. Excerpt: "We cannot conceive of a global external factor that could cause, during this time, parallel evolution of amino acid compositions of proteins in 15 diverse taxa that represent all three domains of life and span a wide range of lifestyles and environments. Thus, currently, the most plausible hypothesis is that we are observing a universal, intrinsic trend that emerged before the last universal common ancestor of all extant organisms." Mathematical models of ocean ecosystems do not suggest that anything besides viruses could link the nutrient-dependent biophysically constrained chemistry of RNA-mediated protein folding from metabolic networks to genetic networks in species from microbes to humans via conserved molecular mechanisms of biologically-based top-down causation and physiology of reproduction. Natural selection is a bestial and racialist dogma based upon white colored skin's suitability for less sunny climates. This is why the subtitle of Darwin's doctrine of evolution is "the Preservation of Favoured Races in the Struggle for Life." The true nature of humanity's evolution is our species' unique and evolving power over the energetic forces of nature, starting with our control of fire. Today, we have control of nuclear fission, soon, if we don't outlaw scientific progress we will have control over thermonuclear fusion, and next in that sequence will be matter/anti-matter reactions. Thus there is a non-linear quantum leap in our species' potential to use ever more powerful sources of energy to expand our well being into the limitless future. You won't find this uniquely human quality in any genetic mechanism.